This paper is designed to act as a guide for working with local communities in rural Afghanistan at the wuluswali (district) level, primarily in the east and south. Afghan society has always been extremely diverse from district to district, requiring a flexible, multi-faceted approach to governance. This multi-faceted approach blended tribes, Islam and the state. The political upheaval of the past 40 years has disrupted Afghan society and the traditional structures which historically provided governance and social order, not just the Kabul-based government. 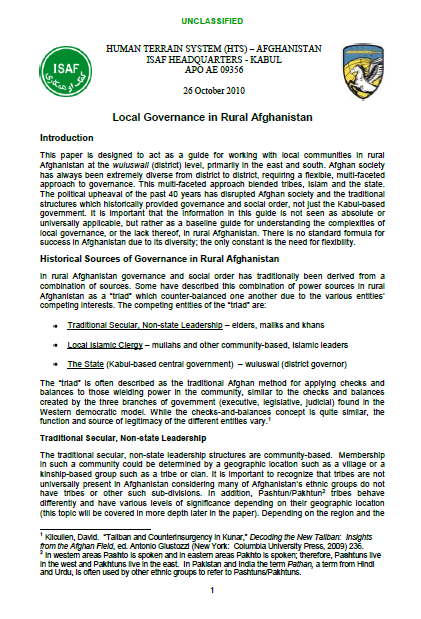 It is important that the information in this guide is not seen as absolute or universally applicable, but rather as a baseline guide for understanding the complexities of local governance, or the lack thereof, in rural Afghanistan. There is no standard formula for success in Afghanistan due to its diversity; the only constant is the need for flexibility. The “triad” is often described as the traditional Afghan method for applying checks and balances to those wielding power in the community, similar to the checks and balances created by the three branches of government (executive, legislative, judicial) found in the Western democratic model. While the checks-and-balances concept is quite similar, the function and source of legitimacy of the different entities vary. The second element of the traditional, governance-providing “triad” has been the local mullah. The mullah has derived his authority from his position in the community as the one who sanctions social practices such as funerals and marriages, provides religious and educational services, and guidance with faith issues. The role and status of the mullah in rural society has varied from north to south and east to west. Usually mullahs do not come from elite families, but rather from the less-affluent, title-less families of commoners. In some areas the mullah has had little traditional prestige, but like most rural Afghan leaders he utilizes patron-client relationships with followers to increase his authority. Such patron-client relationships often provoke rivalries with tribal elders and other secular leadership in the community. The rivalry has been based in the fact that the mullah and the elder derived their authority and legitimacy from different sources. In addition, as independent-minded individuals the traditional Pashtuns, in a counter-establishment stance similar to that of Martin Luther, felt that they had a direct line to God deemphasizing the importance of the Islamic clergy in their communities who were often economically and politically-minded. Pashtuns, unlike some of Afghanistan‟s ethnic groups, are divided into tribes. The two main macro-level tribal groupings are the Durrani and the Ghilzai. The Durrani are sometimes referred to as Abdali. Some have used the term confederation when discussing the two macro-level groups. Although these two tribal confederations comprise the majority of Pashtun tribes, there are other macro-level tribal groupings such as the Karlani Confederation which is mainly in the east. In addition, although tribes can be categorized and classified, as with anything, there are anomalies. Like the macro-level Durrani-Ghilzai split, the Zerik-Panjpai split impacts the situation in the south as the tribes have competing positions within southern Pashtun society. These tribes have more divisions with sub-tribes and smaller sub-tribes of those sub-tribes. For example, the Muhammadzai are an important sub-tribe of the Barakzai. The Ghilzai are even more diverse and have even more tribes and sub-tribes than the Durrani Confederation.